How to Calm a Crying Baby. An Easy Technique for Parents. When babies cry and parents can’t seem to comfort them, it can get stressful. This video shows you how to calm a crying baby in just a few seconds. 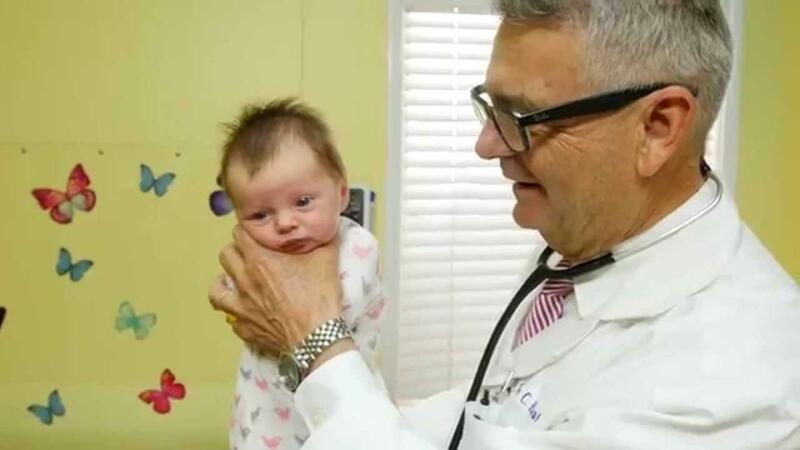 Dr. Robert Hamilton Demonstrates how he calms crying babies in his office. You’ll learn how to calm a crying baby fast and effectively. Gently pick up your baby making sure to support his neck and head. Fold his left arm over his right arm and secure the arms with your hand. This provides some compression and helps calm the crying. Grasp the diaper area and keep your arm on his chest. Rock at a 45-degree angle. Babies are used to feeling comforted by the pressure and feeling of security in the womb. When you place your baby in this hold, he feels comforted similar to when you swaddle him. Parents know that a baby can cry for anything. It’s such a relief to find something that can actually comfort your baby and still stop the crying. Have you tried this method? Do you have your own method that never seems to fail? Share with the community and tag your photos with #FeedingMyKid on Facebook and Twitter. Newborns can get fussy. This easy technique from a Pediatrician teaches parents how to calm a crying baby quickly and comfortably. Previous articleBetter than Box Recipes: Brownie Recipes from Avocado to Gluten-Free. Something for everyone.